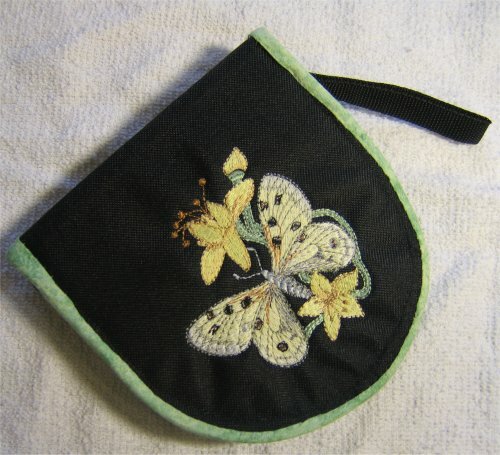 The local Janome store offers classes in heirloom and embroidery techniques and projects. I often take advantage of these classes to learn these techniques, even if I don't particularly care for the actual project. I've discovered, over time, that there is always something to be learned in these classes ... sometimes it's not connected with the lesson/class per se but with a comment from a fellow student. 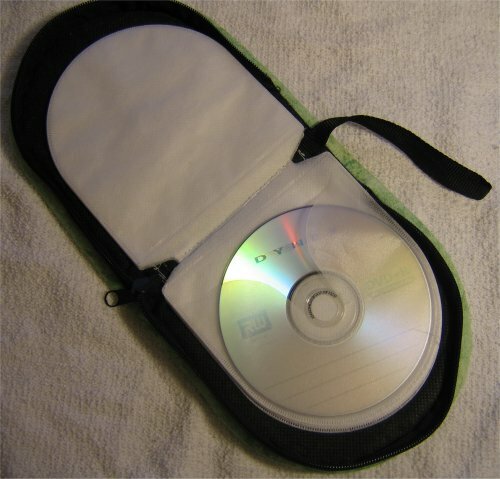 This CD case cover was bought ready-made at Michael's (a hobby/craft chain store). It happened to be on special for 99¢! For this project, we took off the binding and threw it away. We removed the stitching that held the zipper to the case lining and cover. Once the zipper stitching was removed, the cover was a separate piece and could be embroidered. The lining piece had the CD pages sewn to it through a very thick cardboard insert which served as the the form for the CD case. All the components of the lining were left intact. A heavy weight tear-away stablizer was hooped in the "B" (5x7) hoop; the CD cover was then basted to the stablizer. We had discovered that due to a coating on the inside of the case cover, spray baste wouldn't hold the case cover to the stablizer. Using the "B" hoop enabled both the front of the case cover and the spine to be accessible for a single hooping. The center of both the spine and the front cover were individually marked. This was done so that the design for the front cover and the name for the spine could be accurately placed. A Dakota Collectibles butterfly design was chosen for the front cover; a built-in font was used for the name on the spine and was merged with the butterfly once the butterfly was in the 300e. 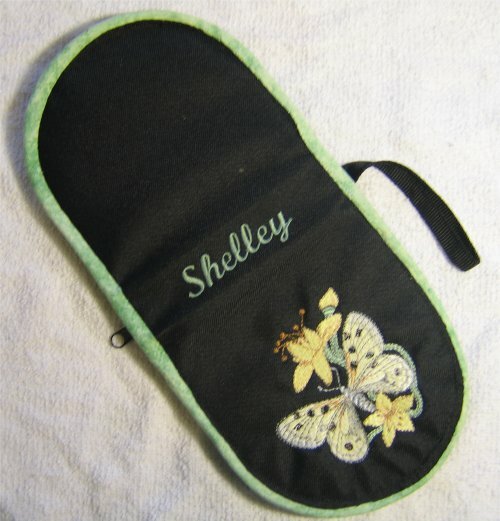 Here's a picture of the butterfly design and name stitching. After the design and name were stitched, the CD case cover was re-assembled. The zipper was basted to the lining piece. The thick cardboard form was trimmed by 3/8" so that the new, replacement binding could be sewn on. (The original binding was sewn right through the cardboard.) The CD case cover was then sandwiched with the lining piece, cardboard form, (very thin) foam padding piece and the outside cover ... all raw edges were basted together. The raw edge was then encased with a new, coordinating bias binding. The bias binding was machine stitched for the first line of stitching, the folded edge turned to the outside cover and hand-stitched in place. The inside of the case cover looks exactly like it originally did when purchased.